Visitors to the Gold Coast are spoilt for choice when it comes to places to eat. New restaurants and cafes pop up all the time, and some of the institutional favourites remain too. Eating out in an area as beautiful as the Gold Coast is only made better by the incredible weather this part of Queensland enjoys. Many of the eating establishments enjoy ocean views and fresh ocean breezes, making alfresco dining one of the best activities on the Gold Coast. When I recently asked Australian triathlete, Courtney Atkinson, where his favourite place to eat on the Gold Coast was his answer was swift. “Bam Bam Bakehouse”, he said, “I’ve been coming here for years and it’s perfect as it’s close to where I live”. With that as a recommendation, I was looking forward to checking it out for myself. Tucked away down the side of a nondescript, professional office building on the Gold Coast Highway at Mermaid Beach, Bam Bam Bakehouse brings a cool vibe along with beautiful pastries in a spot overlooking a park. We arrived on a Friday morning, about 8 am, and it was almost at capacity. With no reservations taken here, we waited for only a short time before we were seated at the end of a long share table. Passing my eyes over the “Bam Bam Benny”, breakfast roll and acai bowl, I settled on a croissant. Bam Bam is well known on the coast for its fancy, French-inspired pastries, even having a cooking school to show others how it’s done. The croissant was fabulous, light and flaky as they should be. But, it was the fresh leg ham and oozy gruyere cheese that had this croissant hitting the high notes. The addition of red pepper jam was a perfect accompaniment. I couldn’t say the same for my hot chocolate, however. I’m a purist when it comes to this hot drink and adding bits of Oreo cookie that went soggy and stuck in my teeth as I sipped were just unnecessary. As was the presence of a hazelnut flavour which I later discovered was Nutella. Bam Bam Bakehouse is open from 7 am – 3 pm every day. ELK Espresso is the place NOT to come to if you want peace and quiet. With those seated both inside and outside this popular Broadbeach cafe adding to the audio levels, it can be at times hard to hear those across from you speaking. Located right near the beach, it’s a convenient spot for early morning walkers and surfers alike to pop in for breakfast or brunch. Serving from breakfast through to lunch, it’s also one of the key spots in this area for coffee lovers to stop by and pick up a takeaway of their brew to feed their habit. Like many of these super busy spots on the Gold Coast, reservations are also not taken here. Those trying to keep to a more healthy diet could indulge in a selection of porridge, bircher muesli or even the breakfast salad. I’m not really one for having garden greens for breakfast, so settled for some standard fare of bacon (from Byron Bay) and soft scrambled eggs. Other interesting menu items included pork and fennel sausage, creamed leeks, cauliflower and gruyere cheese. ELK Espresso is open daily from 6 am until 4 pm with the kitchen closing at 2.30 pm on weekdays and 3 pm on weekends. If you are looking for great food close to the Avani Broadbeach apartments, look no further than this restaurant. As its name suggests, the restaurant is somewhat hidden. 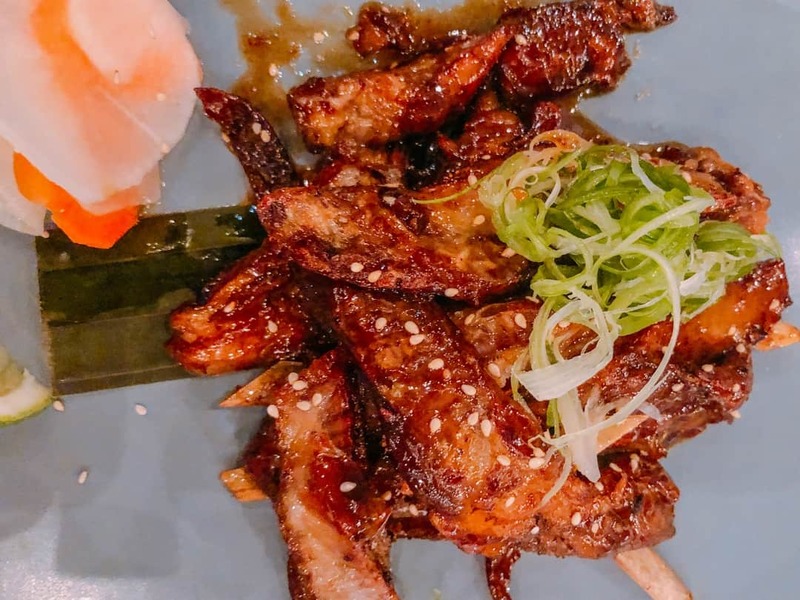 Outside of the central eating area of Broadbeach and covertly lodged in between a smaller apartment block and an older style, two-storey orange brick block of flats, the Hideaway Kitchen and Bar is anything but old. Offering up Asian inspired street food Hideaway is a fun place to eat or catch a drink before heading out to dinner elsewhere. The swings at the bar are the first things I notice as I enter, and I’m immediately taken back to the speak-easy bar we went to in Bangkok. Here, customers can sit on rope swings (for one or two people) and enjoy a drink at the bar. Out the back, a breezy undercover alfresco dining area allows customers to eat under rows of bright umbrellas, reminiscent of the streets of Hoi An in Vietnam. I’m feeling the Asian vibe already! The menu here is of reasonable size and even though it is quite possible to order and enjoy your own selections, it is geared quite deliberately towards share plates. As part of a table of eight dining here, we decided very quickly to participate in some friendly food sharing. Once a table reaches ten people they may only order from the set menus. Whilst this sounds restrictive, there are a number of fantastic set menus (banquets) to choose from. Despite being under the ten, we also elected to have the “Street Feast”. Edamame beans with chilli salt kept us entertained whilst our drinks came out. The banquet provides a great coverage of some of the main dishes on their menu, and also allows for dietary issues, for example substituting seafood with other protein. The lamb ribs were out of this world, deliciously coated in a sweet sauce. Soft, sticky pork belly, inside an even softer bao bun, was perfectly matched with a crunchy slaw. As the food continued, it was a fight for my most enjoyable dish. Salmon sashimi, steamed vegetable dumplings and prawn and salmon fishcakes followed in a seemingly non-stop food parade. Noodles, beef rendang curry and wagyu skewers brought the meal to a tasty end. Hideaway Kitchen and Bar is open from 12 noon until late Monday to Friday and until midnight on Saturday and Sunday. I have very fond memories of my time in Greece eating as much souvlaki and gyros as I could. Fortunately, The Lamb Shop was able to deliver Greece to me once more. From within a narrow tenancy, with just enough room to seat people along a narrow bar, the rotisserie is the star of this Greek show. 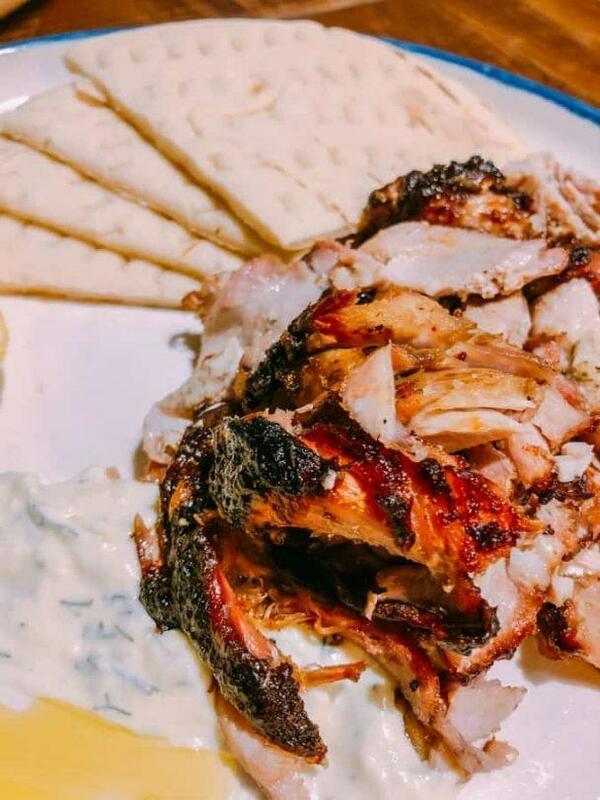 It’s simple fare here with chicken and lamb the key proteins of choice, ably supported by soft pita, tzatziki, and few salad items prove that you don’t need an extensive menu to please the patrons. Whilst this might sound unadventurous, I can assure you that when the crunchy, caramelised edges of either the lamb or chicken are placed before you, the chat will stop as you turn your attention to eating. We ordered the small plates, similar to the souvlaki menu option except double the amount of meat (200g) and without the salad. I’m quite sure they gave us cutlery to accompany this meal, but for us, this rustic meal justifies the use of our human knives and forks. With our hands, it’s easy to scoop up some delicious lamb in a piece of pita and on the way upwards to your mouth, be smothered in a little tzatziki and olive oil. A side of hand cut chips with mustard mayo and another with fetta and olive oil round out the meal nicely. I also can’t help but do it like the Greeks do, adding some of the crispy chips to my pita. The Lamb Shop is open from 11 am until 9 pm daily and also has a restaurant in Brisbane. Even though there are so many wonderful places to eat on the Gold Coast, I’m always partial to somewhere that has an oceanfront location. There’s just something special about seeing the water and feeling the fresh sea breeze on your face. In this climate, it’s also sometimes necessary just to keep us from overheating! Baskk restaurant, with a prime oceanfront location at Kirra, on the southern end of the Gold Coast, serves up modern Australian food with a strong focus on seafood. It also flies with the common trend of share plates, making choosing what to eat a little easier in large groups. Once again, we opted for a selection and were more than delighted with our food. Larger plates of torched miso salmon, kimchi and ginger went well with the Louisiana blackened chicken and so-called forbidden rice. I struggle at times with the wisdom of calling foods by odd names. Looking a lot like wild rice, I think restaurants just get a little too clever for their own good and should just call it what it is. It would, at a minimum reduce the number of questions from those with food intolerances or food-hates. Baskk is open every day from 11.30 am until late. Sometimes, our busy lives get in the way of being able to go to a cafe or a restaurant for food. The hotel you are staying in may not have cooking facilities, or you haven’t had time to get to the grocery store. Thank goodness then for catering companies like Just Finger Foods who are able to take the hassle out of food preparation. 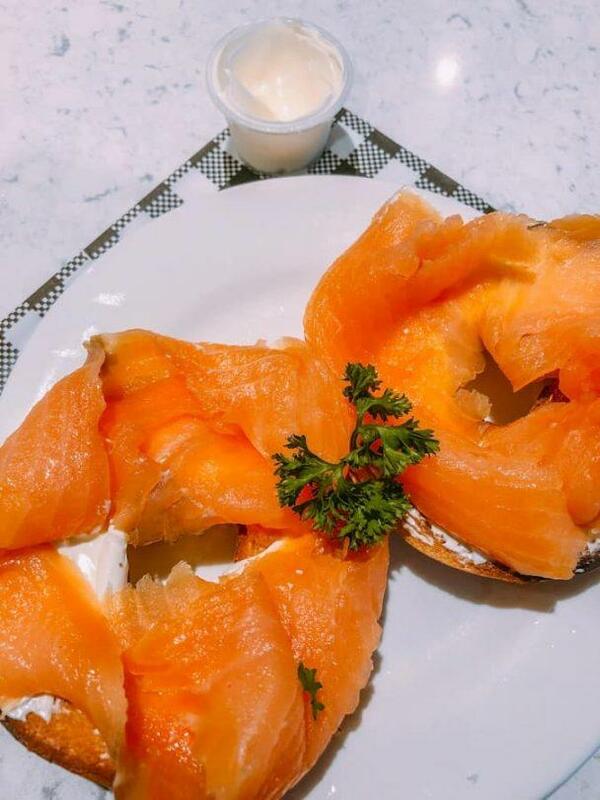 Smoked salmon, cream cheese and bagels were all provided as part of our breakfast pack. These are just a few of the places you can find to eat in Broadbeach that offer simple, non-fussy dining, without a huge price tag. If you are spending a few days here, why not try them out. Better still, find some new ones and come back and tell me about them.